The Griz Family Portal allows students to identify a person as a proxy and grant permission to the designated individual to perform certain tasks. Creating a safe campus through a strong community. Locate all the most vital offices and services in the Lommasson Center. New to CyberBear? For instruction, click here . Registration for Summer Session 2019 is now open in Cyberbear. Summer Session is a great opportunity for students to complete required classes and stay on track to graduate in four years. See summer semester for more information. Summer 2019 registration bills will be available at 1:00 pm on April 15, 2019. For information about Summer Semester Deadlines, click here. Students can register and adjust their Spring classes on CyberBear through the start of the semester. Advising PINs are required for undergrads to register and can only be given by advisors. The Advising Directory is a great place to start if you’re not sure how to find your advisor. Remember to waitlist for any full classes you’d like to take. This helps departments measure demand and possibly open more sections or seats. Note: Paper forms were mailed on January 17th to those students that did not choose to receive them online only. The Deferred Payment Plan online application process is unavailable for the remainder of the Spring 2019 term. If special payment arrangements for the Registration Bill are needed, please call (406) 243-2223 for assistance. For students that have been approved for the Deferred Payment Plan, please see the Spring 2019 payment deadlines below. Second payment due March 1, 2019. Third payment due April 1, 2019. Fourth and final payment due May 1, 2019. ** The use of the Deferred Payment Plan may be revoked if the first payment is not made by the due date. A $15.50 late fee is assessed on DPP payments not paid by the due dates. Click here for more information or contact Business Services at 406-243-2223. UM partners with NelNet Business Solutions for the delivery of student refunds. Files are shipped to NelNet every Tuesday and Friday. Some exceptions may occur during holiday weeks. Enter Cyberbear to select your option and navigate to the Student Refunds page for more detailed information. Contact Student Account Services at 406-243-2223, Mon-Fri, 8:00 am – 5:00 pm. 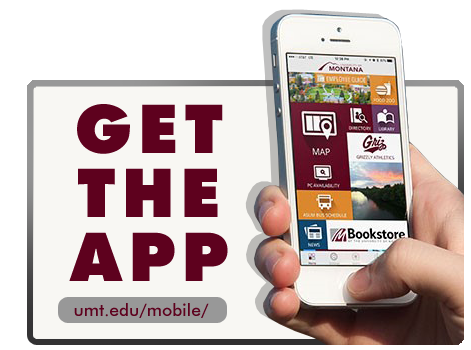 A new mobile app designed in-house by UM’s Information Technology department now offers users easy access to commonly searched for information, integration with UM academic tools and the ability to conduct University business from your phone, tablet or a web browser. Get The App! View the complete course catalogue available online. Go Griz! with the official website of Grizzly Athletics. UM Allies - for an inclusive and supportive campus.